Castrol has a long and impressive history of providing exceptional lubricants to support exceptional endeavours not just in motorsport, but wherever there is a significant challenge. Castrol has played a part in successes from setting world land speed records, to Le Mans Championships and extending to the outer reaches of space lubricating the Mars Rover vehicles. Castrol Australia has a long history of locally developed lubricants that support Motorsport in this country. It is well understood that the lubricants used in vehicles complying with recent emission standards are trending to ever lower viscosities, but what is happening to lubricants used in Motorsport? Both Motorsport technology and road car development have progressed significantly since the ‘80s when Larry Perkins’ and Peter Brock’s Castrol-backed VH SS Commodore were winning Bathurst 1000 races. It was from this gruelling testing ground that Castrol GP 50 and Castrol SAF-XA were developed. These two standout formulations have evolved since their introduction. Their current brand names are Castrol EDGE 25W-50 and Castrol Syntrax 80W-140 and both products continue to deliver their race proven performance. As engine technology has continued to evolve in the never-ending push for performance gains, so too have the lubricants. To this end, Castrol-supplied engine oils such as Castrol SLX 0W-30 and Castrol TXT 10W-40 were used in Russell Ingall’s Commodore, products chosen only after a variety of specifically formulated developmental grades were trialled with the team. Critically, these lower viscosity grades provided equally strong performance in these arduous conditions. 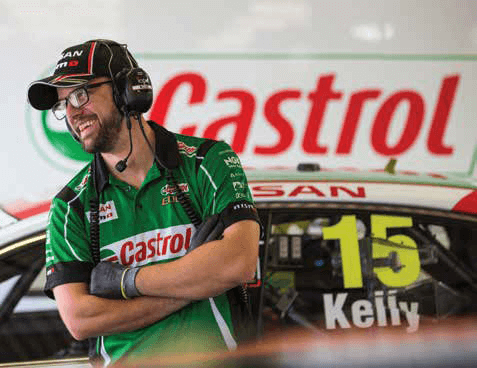 Today, Castrol partners with Kelly Racing to provide performance lubricants for their V8 Nissan Altima Supercars. With #15 Castrol Racing Nissan Altima going from strength to strength this season – including a race win at Winton in May – it’s easy to forget the unique technical challenges the team faced since the launch of Nissan in the Supercars category. The move by the team from Holden to Nissan was as big a change for the Supercar category as it was for Kelly Racing. Moving from a well understood platform of push rod V8s with roller rockers to a relatively unknown overhead cam and timing chain driven V8 platform set the team a significant challenge. Castrol worked with the Kelly Racing engine development group to provide an engine oil platform that could grow with the team as they came to grips with their newly adopted engine technology. Rick Kelly and the team have very clear requirements for Castrol on the performance they expect from their lubricants. 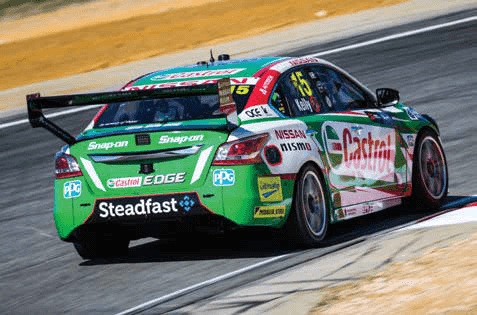 Withthe introduction of the Nissan engine and overhead cam, Castrol Australia worked with their global product development and motorsport counterparts to identify candidate products which Kelly Racing could put through their thorough evaluation program. Finding a candidate oil means identifying lubricants with low foaming characteristics to suit the dry sump arrangement employed by the category, good shear stability and viscosity control over varying temperatures and conditions and great wear control to maximise component life. The oil also needs to be compatible with the DLC coatings used on various engine components. Once the candidate oil is identified, Phase 1 in the evaluation process is to run dyno comparisons against the current Castrol developed race oil. This ensures the product provides a performance benefit worth pursuing and at the same time meets all of the Kelly Racing team’s requirements. Once satisfied with the oil’s performance in this area Phase 2 commences in which the oil is tested in just a single engine during practice sessions. After the dyno testing and practice sessions, oil analysis and engine inspections are performed with Castrol engineers working with Kelly Racing to identify any issues that would result in the product not progressing to Phase 3 – limited race use. Finally, once satisfied with the performance of the candidate oil, the oil is then used in one engine during all further practice sessions, qualifying and finally in the punishing racing series. Throughout this process the team and Castrol maintain a rigorous routine of oil analysis, and engine inspections to monitor for changes in wear control of the sensitive overhead gear and timing chains. Only once all these hurdles have been cleared will the candidate oil finally be rubber stamped for team-wide use. For Kelly Racing and their four Nissan Altima’s, that chosen oil is Castrol EDGE. “The partnership with Castrol allows us to work together to utilise improvements brought to the table. Likewise, as we push the limits of our equipment, if issues arise we can work with Castrol to identify root cause and then solutions to allow us to keep advancing,“ adds Tony.